Do you love your neighborhood? 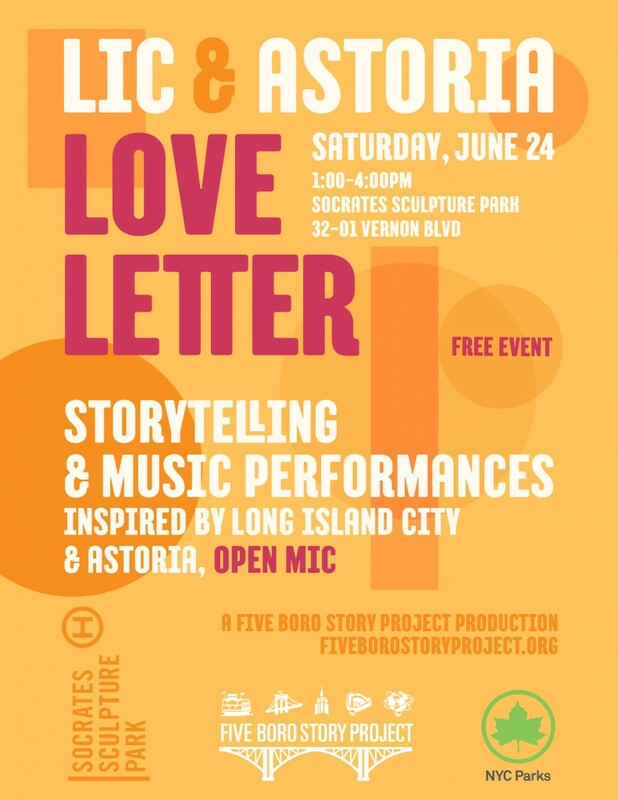 Join us for “LIC & Astoria Love Letter”, an afternoon of storytelling, music, and Queens Love in beautiful Socrates Sculpture Park. Meet neighbors, hear true life stories about growing up in these neighborhoods from long-time residents, and enjoy performances of music inspired by Astoria and Long Island City. 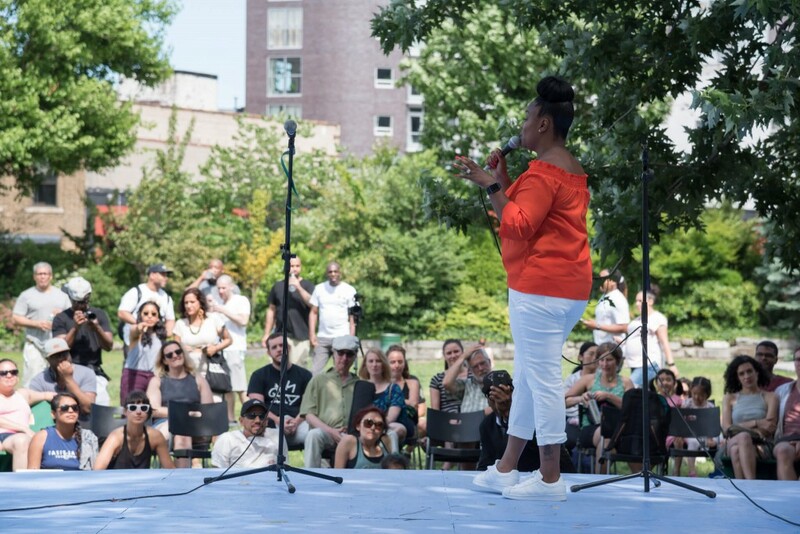 Share your own stories and more in our open mic, write a love note to your neighborhood, and leave your mark on the park with participatory art-making activities reflecting the local landscape. * Louie “KR.ONE” Gasparro – native Astoria artist, musician, author, actor, producer and legendary graffiti writer from NYC’s golden era of subway graffiti. * Jim Hawkins – storyteller who combines the rich traditions of Irish storytelling with his memorable experiences of growing up in Astoria. * Gary Lucero – social worker and LIC native who captures his ever-changing neighborhood and evolving city through stories and photography. * Yvette Ramirez – arts administrator, oral historian and aspiring archivist born & raised in Astoria whose work explores the meaning of “home”, diaspora and memory. * Roxanne Shante – legendary hip hop artist from Queensbridge and first female rapper to have Platinum singles and Gold albums. These intergenerational performers will share their love for their neighborhoods with engaging tales about their experiences growing up in Long Island City and Astoria, and discuss the changes and challenges that they and other residents face, in particular gentrification and displacement. Plus get free ice cream from Big Gay Ice Cream! Socrates Sculpture Park is located at 32-01 Vernon Boulevard in Long Island City, at the intersection of Broadway. By train, take the N/W to the Broadway stop and walk 8 long blocks west on Broadway (toward the East River). By bus, take the Q103 or Q104 bus to Broadway and Vernon Boulevard. View photos from “LIC & Astoria Love Letter” HERE. 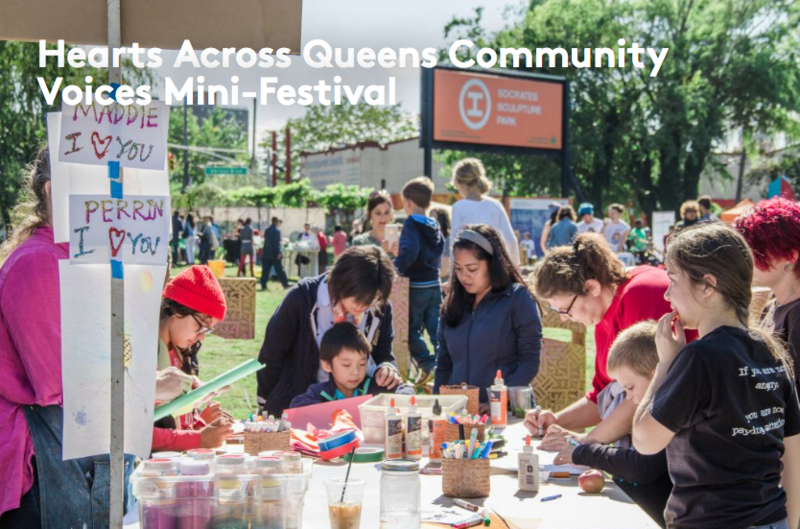 Come share your story and learn about your neighbors at the Community Voices Mini-Festival! Story circles for all ages will be led by Five Boro Story Project and Growing Up Green Charter School, and Global Kids will perform the original work, Ping Chong’s “Undesirable Elements,” the most recent in an ongoing series of theater works examining issues of culture and identity. Attendees are also invited to create artistic “hearts” featuring messages of love, unity, and solidarity that will be displayed around Astoria. This is a partnership with Hearts Across Queens, Global Kids, Growing Up Green Charter School, and Five Boro Story Project. Come to our story circle and share memories of Long Island City and Astoria, and stories about what it means to be a neighbor. Throughout the festival we will have a station where you can write a love note to Astoria and/or Long Island City. The love notes will be displayed at “LIC & Astoria Love Letter” at Socrates Sculpture Park on June 24th.